AFTER being vacant for months Portsmouth shiphall is once again a hive of activity – now as a world-class maintenance hub. This week has seen the official opening of BAE Systems’ Small Ships Centre of Specialisation within the expansive hall. The facility, which is part of the newly-named Vernon Complex within the naval base, is now the primary centre to refit the navy’s fleet of eight Hunt-class mine counter measure vessels. 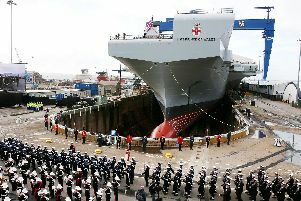 It is all part of a move by the defence giant to speed up upgrade work on the ships. Work has already begun on HMS Brocklesby to replace the aging vessel’s engines as well as overhaul the rest of the 750-tonnes ship inside and out. Barry Woolley, director of project and operational performance at BAE Systems, said the facility represented a huge leap in capability. ‘This is really a dream come true for me,’ he said. ‘I have worked here for 30 years. So I have been supporting ships out of Portsmouth with what is essential a Victorian infrastructure. The centre is entirely covered from the elements meaning the weather won’t cause any delay to the maintenance work. Before the facility was opened, much of the refitting operation took place on different sites in the base. Now all this work has been carried out under one roof. It means refits that could have taken upwards of 18 month have now been slashed to just under a year. Captain Philip Milburn, is the captain of minewarfare and patrol vessels, diving and fishery protection. He said: ‘This is about delivering ships back to the front line quicker and faster without the impact of weather delays to the programme. A team of 100 people will work on Brocklesby per week – with this rising to 250 at key points of the scheme. In total, 190,000 man hours will be spent on refitting the 30-year-old minehunter. Once work is completed, she will have stronger, quieter more fuel efficient engines. On top of this, a deep survey will be conducted to test the remaining lifespan of Brocklesby. Portsmouth South MP Flick Drummond welcomed the opening of the facility. She said: ‘The Royal Navy leads the world in mine countermeasures and our allies in trouble spots like the Persian Gulf depend on that capability to keep shipping lanes clear. ‘This programme of upgrades will keep our ships at the forefront of the latest technology and I am delighted to have this new work in the dockyard to match the investment in maintaining the new aircraft carriers and Type 45 destroyers there. The navy has eight minehunters based in Portsmouth. Four are based in The Gulf.